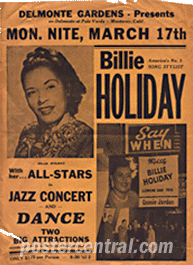 Here are four examples of original, authentic Billie Holiday concert posters and smaller handbills from the 1940s and ’50s. Be sure to see our other outstanding example on our Jazz page. 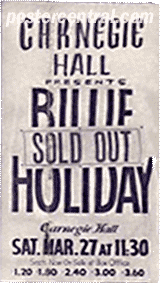 Ms. Holiday had a checkered but legendary career that didn’t seem to produce any consistent series of concert advertisements, unlike her contemporaries Louis Armstrong and Duke Ellington. 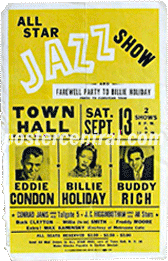 I will pay top dollar for any Billie Holiday concert poster of this vintage! 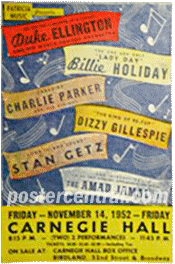 Details on the concert posters pictured above, all original, all printed before the event for the sole purpose of selling tickets: Billie Holiday in her triumphant return to Carnegie Hall, New York City, March 27, 1948; Billie Holiday in concert with Duke Ellington, Charlie Parker, Dizzy Gillespie and others at Carnegie Hall, New York City, Nov. 14, 1952; Billie Holiday in a Jazz Concert and Dance at Delmonte Gardens in Monterey, California, March 17, 1952; and Billie Holiday in an All-Star Jazz Show with Buddy Rich and Eddie Condon, Town Hall in New York City, Sept. 13, 1952.